With Spring right around the corner, and the promise of warmer weather ahead (fingers crossed), Canadians are starting to ramp up their physical activity. But even with the nicer weather ahead, we could all use some extra motivation and encouragement. The smallest changes can make the biggest difference when it comes to your health. And I think that a lot of people can forget this. As a nutritionist, I’ve spent years working with clients, making sure that they have the tools that they need in order to succeed, while also making sure to remind them to celebrate every milestone along the way. But the one thing that always seems to keep them on track is accountability. Being held accountable for what you need to meet your goals and for the choices that you make, all while feeling like you’re being supported and encouraged along the way. That’s where my new favourite app comes in. In honour of their 2nd birthday, Carrot Rewards has launched the world’s first peer-to-peer rewards for physical activity. You’ll remember Daniel told us about #CarrotRewards earlier this year. Now, even more Canadians can get active and learn all about making healthy choices for themselves, their loved ones and for the planet. This brings it right back to putting those tools right into your own hands – while being rewarded for these decisions. The award-winning wellness app is celebrating one million downloads with the launch of a new Step Together Challenge™ platform and we’re so excited to start using it right away! Now as you may already be aware, Carrot Rewards is a platform that leverages behavioural economics and nudge theory to motivate Canadians to make better everyday lifestyle choices. It harnesses the power of the most popular consumer loyalty programs in Canada to maximize appeal and user engagement. Users of the app can earn their choice of Aeroplan® Miles, SCENE® Points, Petro-Points™, Drop Points and More Rewards® Points each time they interact with the app – through fun quizzes, linking up your step-counter and more! I’m not sure about you, but I love loyalty points and programs. It makes me feel like I’m actually being appreciated for all of the money I’m spending or for the time I’m investing in a company or product. And having them all right on my phone, with easy access in a one-stop-shop style, is the best option while on the go. 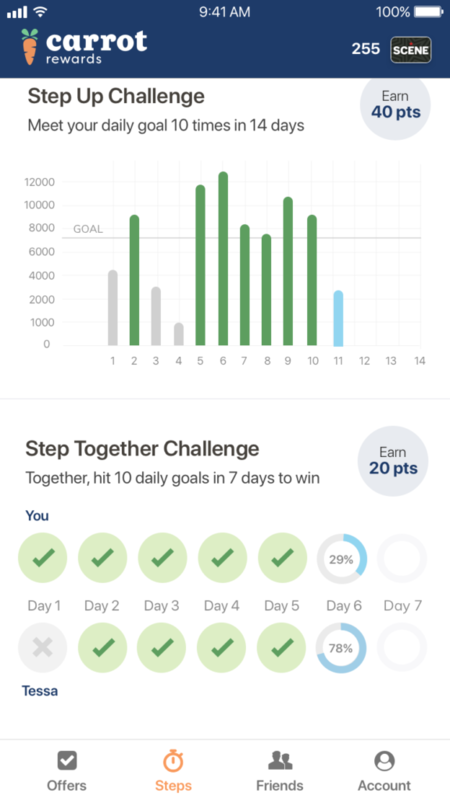 With the addition of the #StepTogether Challenge, there’s even more opportunities for you to earn rewards through physical activity, while keeping each other accountable through this never before seen peer-to-peer program. This is the stuff that really sets the tone for achieving those health goals. All you need to do is click on the ‘connect to your friends’ button and invite them to your leaderboard. If you’re a new user to the app (welcome to the best decision you’ve made today), you can download Carrot Rewards, enable your steps and in one week’s time (once you are given your daily walking goal), you can start your Step Together Challenge with your friends! This new feature is aiming to drive even more Canadians into celebrating their healthy, active lifestyles. To date, Carrot has been so effective at doing this, that they have driven an unprecedented 20 per cent average increase in daily physical activity among its hundreds of thousands of users across the country, so far! Now those are some great results. We’ve also launched an exciting contest for one lucky Canadian to win a HUGE points bonus for their loyalty program loaded on their profile. Click here to enter on Instagram. And here’s an extra chance to enter just for those of you reading this blog post. Be sure to download Carrot Rewards – click HERE to download the app from iTunes and HERE from Google Play! 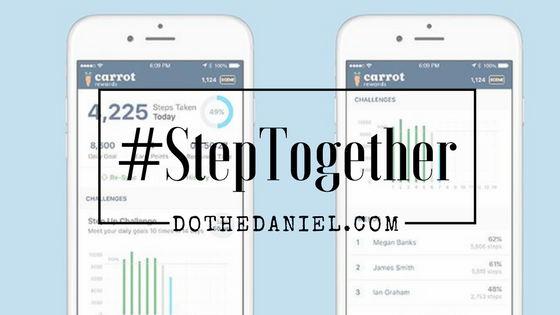 To introduce the new Step Together Challenge, Carrot is offering double points over the next two weeks to all Canadian users who try this innovative new feature! Join us in the challenge, but also in the social media conversation by following @Carrot_Rewards on Instagram, @Carrot_Rewards on Twitter and by “Liking” their Facebook Page. Use and follow #StepTogether & #StepTogetherChallenge hashtags – the question is, who will you partner with for your #StepTogetherChallenge first? !